Disney Infinity: Marvel Super Heroes - Introducing the Villains! 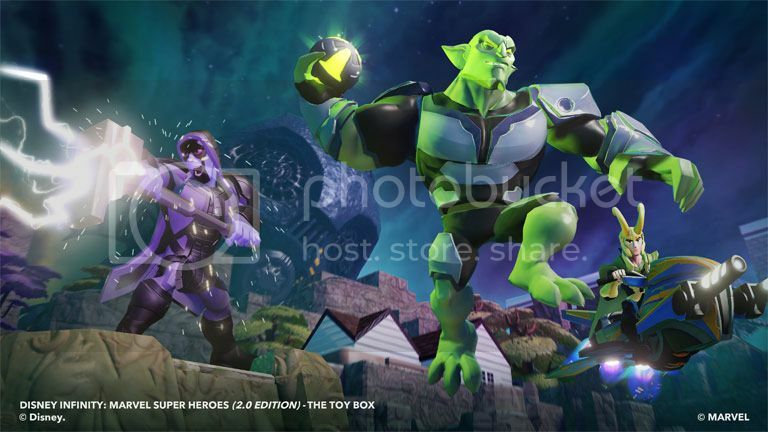 *Bilingual article / *Artículo Bilingüe - The Super Villains of MARVEL are coming to Disney Infinity! 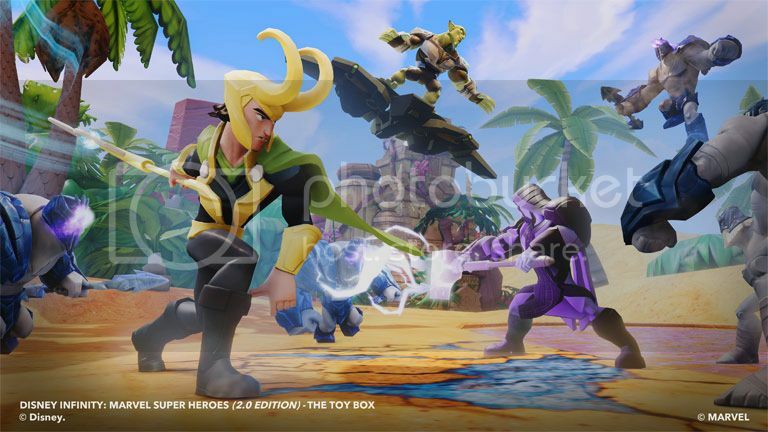 / Los Súper Villanos de MARVEL llegan a Disney Infinity! The Disney Infinity news keeps rolling in. Disney Interactive has announced that some of Marvel's villains will be coming to Disney Infinity 2.0. The set will include Ronan the Accuser, the Green Goblin and Loki. Enjoy the screenshots and trailer! The press release is below, in both English and Spanish. 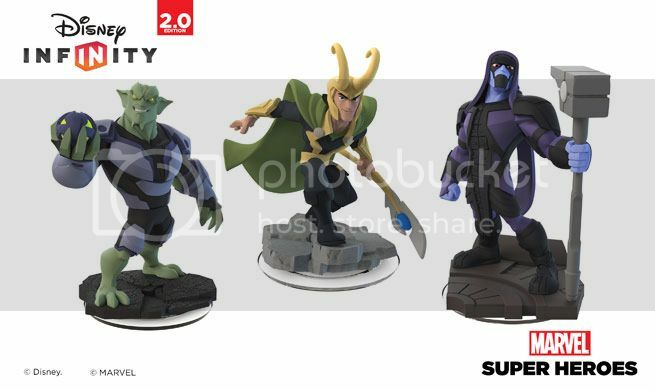 Disney Interactive officially announced that a trio of popular Super Villains will be entering the world of Disney Infinity: Marvel Super Heroes (2.0 Edition) - Ronan the Accuser from Guardians of the Galaxy, Green Goblin from Spider-Man and the infamous Loki, God of Mischief from The Avengers. Whether it's flexing their unstoppable powers for all things evil in their respective Play Sets, the updated Toy Box 2.0, or the newly added structured Toy Box Games, these Super Villains are forces to be reckoned with. Ronan: Wielding the Universal Weapon, the ruthless Ronan the Accuser is an unstoppable force in both the Guardians of the Galaxy universe and in the Toy Box mode. Cloaking, energy blasts and super human strength are all part of the powerful arsenal at Ronan's disposal as he vies to become the mightiest villain in the galaxy. Green Goblin: Armed with Pumpkin Bombs, the brilliantly nefarious Goblin uses his Electro Shock Gauntlet to dispatch opponents handily in the world of Spider-Man. Super human strength, spectacular super jumps and the ability to charge his bombs into more powerful bolas all make him a villainous force to be reckoned with for both symbiotes and Super Heroes alike. Loki: The God of Mischief is at your command when you play as Loki in Disney Infinity: Marvel Super Heroes. Whether hassling Thor and Hulk in the Avengers Play Set or exploring the treasures found in the Toy Box mode, Loki's sure to have a few tricks up his sleeve. From defeating his opponents with a powerful scepter to projecting decoy versions that bewilder even the cleverest of heroes, Loki is the villain you'll love to hate. Creating mischief has never been so fun! Disney Interactive anunció oficialmente el día de hoy que tres súper villanos populares formarán parte del mundo de Disney Infinity: Marvel Super Heroes (2.0 Edition) – Ronan el Acusador de Guardianes de la Galaxia, Green Goblin de Spider-Man y el famoso Loki, Dios de las Travesuras, de los Avengers. Mientras demuestran sus poderes indetenibles para todas las cosas de mal en sus respectivos Play Sets, el renovado Toy Box 2.0 o los nuevos juegos estructurados Toy Box Games, estos súper villanos representan una fuerza que hay que tener en cuenta.